On Friday 18th March, Forever Manchester supporters turned into daredevils to raise money to support community activity across Greater Manchester. On a typical, grey and windy Manchester day, our supporters took to the skies, plunging 120ft from the Emirates Old Trafford, home of Lancashire County Cricket Club, raising an impressive £3,500 in the process. But it wasn’t just mere mortals abseiling on the day, we had the likes of our very own Captain Manchester scaling the wall, as well as Lancashire County Cricket Club Foundation’s ‘Lanky’ and the grrrrreat Tony the Tiger who represented Kellogg’s UK. The height doesn’t sound much, but trust us – when you reach the top and look down, people seem very small and 120ft is very high, so high in fact that it’s the equivalent of; 7 terrace houses on top of each other, 20 Liam Gallaghers or even 1,406 of Bez’s maracas put together. A great view of 6 of the 10 boroughs Greater Manchester could be seen from the roof, which included Manchester, Trafford, Rochdale, Wigan, Bolton and Bury. As well as the mascots, we had representatives from Corporate Partners, Brother UK, Kellogg’s and Express Solicitors. Ambassadors also donned their brave pants, including; Darren Ratcliffe, Rionne Williams and Jess Cumpstey. 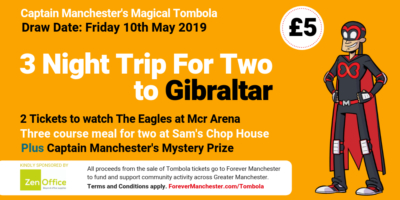 Forever Manchester’s very own Mel Hill took the plunge and we also had Forever Manchester Radio Show co-host Jen Edmondson and producer, Vikki Snowden taking on the challenge on the day. All in all everyone had a great day, and huge congratulations goes particularly to those supporters who faced their fears for charity – you’re all top and it was well worth it too, with over £3,500 raised for the communities where you all live, work, play and most importantly love! Head to our Facebook page to see just how brave your faces looked (FYI – not that brave) while scaling the cricket ground entrance on Friday! Huge thank you goes to Mountain Monkeys, who ensured all of our daredevils were safe on the day, as well as Lancashire County Cricket Club Foundation, who we did our abseil in conjunction with and ensured we were able to use their venue.